Kumquats are tiny citrus fruits that look a bit like teeny tiny oblong-shaped oranges. They have a lovely, bright, sweet-tart flavor that rivals the best, most complex citrus flavors out there. And, unlike most of their citrus brethren, the peel on these inch-long fruits are fully and totally edible. Start looking for kumquats in January—usually not until towards the end of the month, but sometimes they come in earlier. Kumquats stay in season through March and sometimes into April. Buy kumquats with bright, smooth skins that feel a bit heavy for their diminutive size. Avoid kumquats with bruises, cuts, or blemishes of any kind—the edible skin is more delicate and tender than that of other citrus fruits, and also more susceptible to damage. Since you'll end up eating the peel, it's smart to look for certified organic kumquats so you know they weren't sprayed with harmful pesticides. Eat or use kumquats as soon after purchasing as you can. Unlike other citrus fruits, kumquats don't have a long shelf life (those thin, edible peels don't protect them as well as the thicker peels of oranges or lemon). If you do need to store them for a few days, keep kumquats in a paper bag or loosely wrapped in plastic in the fridge. Kumquats make a great snack or light dessert eaten out of hand, or added whole or halved to fruits salads. They are also a great addition to crunchy winter salads like Endive Kumquat Salad. They can also be preserved to great effect as in Honeyed Preserved Kumquats, which are delicious spooned over ice cream or plain yogurt. Or save their flavor in Kumquat Vodka or Gin. Kumquats can also be puréed and made into a luscious Kumquat Cream Pie. No matter how you use kumquats, make sure you give them a good rinse (or even a scrub) to make sure they're clean before you start popping them in your mouth! 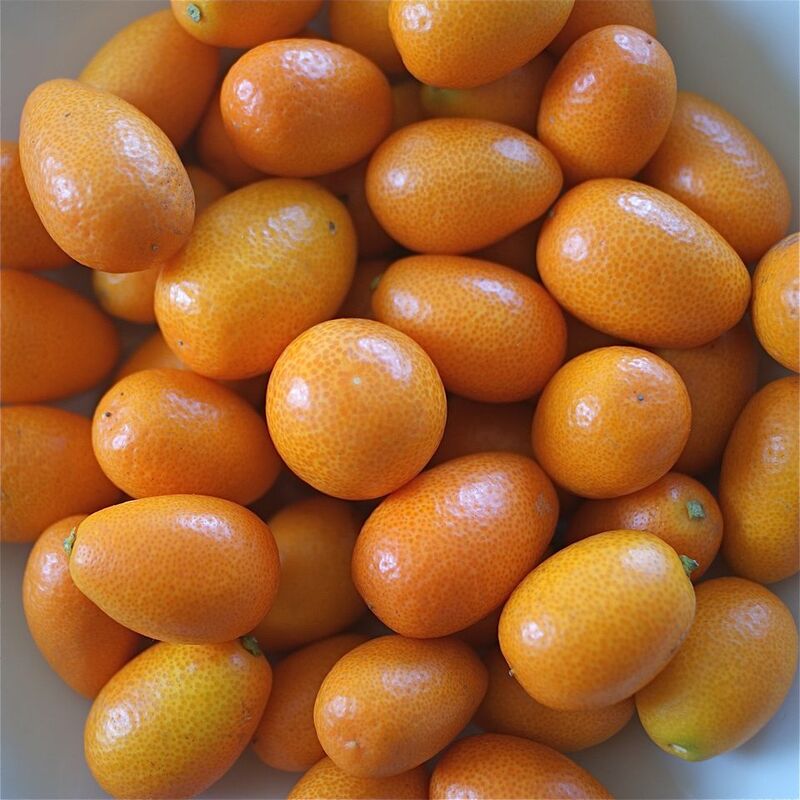 Look for kumquats at farmers markets and specialty stores. Since they make such a healthful snack, they are increasingly available at more places. Kumquats don't fair well in cold weather, and need some heat in the summer to grow the best tasting fruit, so you won't find locally grown kumquats everywhere. Luckily, kumquats grow nicely in pots, so if you're willing to bring those pots inside when the weather turns chilly, you just may be able to grow a few kumquats yourself even in less forgiving climates!